MW2002: Papers: Systematically Speaking: How Do Natural History Museum Web Sites Represent Science? � Archives & Museum Informatics, 2002. Systematically Speaking: How Do Natural History Museum Web Sites Represent Science? The first natural history museum Web sites offered little more than visitor information. Then they began to include more of the nature and scope of both collections and exhibitions. Now, they incorporate sophisticated graphic design and feature active involvement by the virtual visitor, but they can also bring the museums' scientific research work to a larger and more diverse audience. Far from being principally for children, and full of dinosaurs and dioramas, major natural history museums are characterized by a high degree of fundamental scientific research. In the Eighteenth Century, museums were central to the active creation of scientific knowledge, but we now tend to associate science exclusively with laboratories. The popular image of science - test-tube and Bunsen burner - is, for several important aspects of science, inappropriate. One such area is systematics - discovering, describing, naming, classifying organisms and identifying their evolutionary relationships - a major concern of most natural history museums. Yet few Web sites explain its significance, or even make it explicit. This paper explores the representation of taxonomy, systematics and other aspects of science on selected natural history museum Web sites, using two different but related approaches. 1. Science as a human endeavour - science as a social and cultural activity, a human enterprise; 2. Scientists at work - showing what scientists actually do in the process of research; 3. The status of scientific ideas - scientific ideas as theories or models, rather than as incontrovertible fact or the revelation of truth; 4. Doubt and debate - introducing scope for further questioning and reinterpretation of evidence. ; 5. Opportunities for visitors to formulate their own opinions - reflecting the social construction of science. The paper shows that some natural history museum Web sites are now beginning to share their passion for science, especially less fashionable areas such as systematics, and that such developments coincide with changes in views about the public understanding of science and about the roles of museums. When it comes to attitudes to science, there is, it appears, no such person as the average man or woman. A recent study concluded from extensive sampling that, in the UK, there are indeed six types, from the informed enthusiast to the not for me (Wellcome Trust / OST, 2000). Yet, regardless of interest in, aptitude for or knowledge of science, many museum visitors perceive science as a series of facts and laws discovered in laboratories (no doubt by men in white coats) and expressed in difficult technical terminology. They are likely, too, to expect museums to be full of dusty objects supported by the antediluvian opinions of expert curators expressed in obscure language (Hawkey, 2001a). Yet, in the Eighteenth Century, museums were central to the active creation of scientific knowledge. At that time museums were centres both for generating scientific understanding through research and for promulgating that understanding, through science education. Resources fundamental to both areas of activity could be drawn from their collections. Ensuing developments, however, resulted in education becoming the province of schools, while science became confined principally to laboratories. Here, experimentation could take place under controlled conditions, with the consequence that museums came to be regarded merely as places for the storage of existing  and potentially ancient  knowledge (Arnold, 1996). So, what are natural history museums for? Somewhere to take the children on a wet afternoon? For them to marvel at the dinosaurs? Notions such as these, together with numerous other associated assumptions, are prevalent among the general public, visitors and non-visitors alike. What misconceptions! For, more than any other type of contemporary museum, it is the natural history museums that have maintained the museums research role. Indeed, unlike most other museums  including, ironically, museums of the physical sciences and of technology  natural history museums are characterized by a high degree of fundamental scientific research. This research activity is reflected in statements, both intentional and incidental, of the aims of natural history museums relating to using collections to make fundamental scientific discoveries about the natural world. For example, The Natural History Museum (UK) has a mission to maintain and develop its collections and use them to promote the discovery, understanding, responsible use and enjoyment of the natural world (NHM, 1996). Museums per se have such a long-established tradition  the British Museum will shortly celebrate its 250th anniversary  that it is easy to over-estimate the age of museum Web sites. Most date from the mid-1990s; many are more recent; all are continuously and rapidly evolving. The early content of natural history museum Web sites did include something of the nature and scope of both collections and exhibitions, but much was essentially visitor information  about opening times, entrance fees and bus routes. There have subsequently, of course, been vast improvements in graphic design and in enhanced functionality, the latter increasingly featuring active involvement by the virtual visitor. Latterly, other developments of great significance have begun to showcase the museums scientific research work, conveying fundamental ideas about the life and earth sciences to a much larger and more diverse audience. A previous paper (Hawkey, 2001b) explored natural history museum Web sites from the perspective of a science teacher, using an embryonic evaluation strategy that, not surprisingly, put great emphasis on educational issues. The present study attempts to develop further such approaches to the analysis and philosophy and practice of Web sites. To some extent it is forced to rely upon an expert understanding� of natural history museums and issues in science communication, especially in relation to identifying concepts and strategies that are merely implicit. It may at least provide a foundation for the development of a more sophisticated methodology. This paper explores the representation of science on selected natural history museum Web sites. What kind of science is evident? How is it presented (in terms of epistemology rather than aesthetics)? What insights are provided into the underlying philosophy and rationale? Are there indications of the processes of investigation and enquiry or of the interpretation of evidence? What view of scientific knowledge is presented? And, in particular, what efforts are made to explain the contemporary relevance of the science of systematics? What, then, do natural history museum Web sites state explicitly about their science? Table 1 shows a number of useful and informative excerpts from several Web sites, in North America, Europe and Australasia. Many of these give great insight into research practice and, occasionally, philosophy. 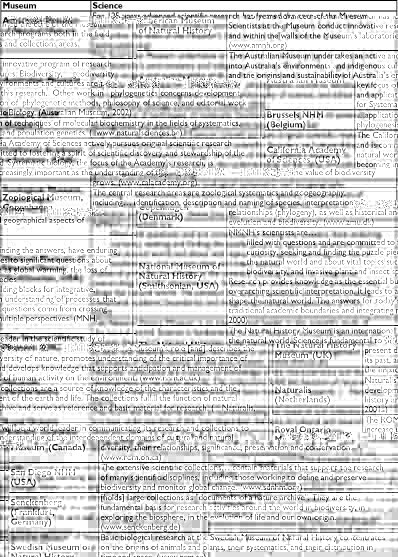 However, the ease with which such material can be located varies considerably, from those where a clear link to Science or Research is evident on the home page to those who provide little more than annotated lists of departmental organization. This tendency for museums to present themselves as inherently divisional or departmental, often with no more general explanations or evocations, was a greater limiting factor in the choice of museums included in this study than was, for example, language. 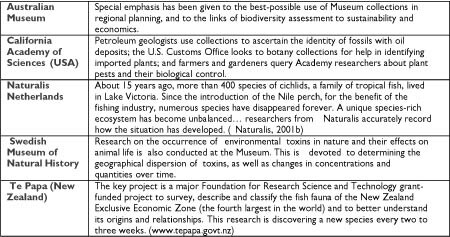 A good example is provided by The Natural History Museum, where departmental designations  Botany, Entomology, Library & Information, Mineralogy, Palaeontology and Zoology  have been augmented, if not superseded, by multi-disciplinary research themes. These are presented in Natural Progression (NHM, 2001a), the Museums strategy for science, which is readily available on-line as a downloadable .pdf file: figure 1. Key elements of scientific enquiry, both process and content, are clearly discernible among the theme descriptors � as illustrated in figure 2 � and are summarized in Table 2). At the next (ie deeper) level, individual projects are highlighted in accessible language (Table 3), but with more sophisticated information and links to further work. Recent developments in thinking about scientific literacy or the public understanding of science have also given increasing emphasis to the processes and practices of science (House of Lords, 2000). This remains a necessary and critical shift in emphasis, despite the fact that many formal science curricula, such as that in the UK (QCA, 1999), have begun include among their requirements some study of the nature, methodology and operation of science, in addition to an understanding of its knowledge base. All of these issues are, to a greater or lesser extent, contained within the research programs of natural history museums. Potentially, at least, they are accessible through the material made available on-line. There are a variety of ways in which issues in this domain can be expressed and annotated. Table 4 shows how Kings (1996) categories compare with those used by Hawkey (2001b), and indicates the synthesis that will be used in what follows in this paper. The human dimension of science is critical in a number of ways, relating not only to who scientists are and what they do but also to which questions society requires them to answer. Presenting science as a social and cultural activity, as a human enterprise, may facilitate enhanced access and help to question the oft-supposed neutrality of science. That science is a human activity (rather than merely pre-determined or abstract) can be reflected to some extent by repetition of the museums scientists, but is best demonstrated by individualized and personalized narratives. Some Web sites, especially those of the larger US natural history museums, include scientists names, photographs, case studies and even live links to the field. For example, Chicagos Field Museum site has on-line exhibits on Women in Science and on Adventures in the Field. Members of the general public have, in recent years increasingly come to question earlier notions that science is inherently beneficial and worthy of support. A heightened realization that science is neither certain nor neutral  especially in its selection of topics for research  has been a significant factor in this. Rationale for research is therefore expected to be explicit, even in apparently non-controversial areas, and natural history museum Web sites are beginning to go some way towards providing this. The most likely to be explicitly expressed, and certainly the most frequently highlighted, is biodiversity. 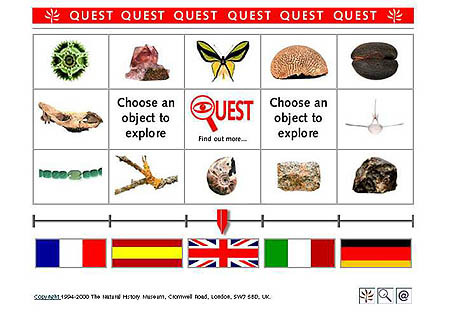 Although a term little understood by non-specialists and absent from many school science curricula  the National Curriculum in England & Wales (QCA, 1999) has recently introduced sustainable development, but biodiversity per se is absent - biodiversity is a theme that looms large in the realm of natural history museum Web sites. Natural history museums display a range of examples of biodiversity resources on their Web sites, with explanations that range from the elegiac to the utilitarian, from the moralistic to the homo-centric. Examples are included in table 5. Other than biodiversity, the most common rationale given for natural history museum research is the benefits that it can offer to humanity: predicting volcanic eruptions and earthquakes, increasing food supplies, locating oil and gas reserves, maintaining and conserving natural resources. Occasionally, reference is made to economic or commercial considerations  and even, rarely, to sources of funding  but often the goal is expressed simply as that of better understanding. In ways very different from that of fictionalized drama, Web sites can also redress the stereotypical notion and show that science is not a list of intimidating abstractions in a textbook; it is the imaginative product of personalities who rarely conform to the stereotype of an egghead with a white coat (Farmelo, 1992). The vast majority of natural history museum Web sites include considerable reference to the research activity of their scientists. This may be implicit  implied by terms such as discover, describe, identify, experiment, analyse  or, more rarely, explicit. They inform visitors that scientists collect specimens from all over the world (and beyond, in the case of meteorites,!) and study them using a plethora of techniques. Central to this scientific process is the collection of data and its subsequent analysis, and almost every site includes reference  whether in outline or in detail  to more traditional and/or contemporary methods. Table 6 indicates a range of these, divided into predominantly field and laboratory techniques, drawn from a variety of sites. Some sites try to give visitors an insight in the enquiry process by involving in what is essentially a role-play activity. One such is QUEST (NHM, 1998). Here, would-be researchers are presented with a series of unidentified objects and a set of virtual tools with which they can magnify the object and look at it from different angles, find out fundamental features, such as mass, size and texture, and gather more sophisticated data including age and an image (if any) under uv light. They then make their own on-line record, with any other observations they may wish (Hawkey, 1998, 1999). There are even examples that encourage active participation in the collection, identification and mapping of organisms such as woodllice (Hawkey, 2002a): figure 4. Is science presented as unquestioned answers to unanswered questions (AAAS, 1993)? Do natural history museum Web sites expect their virtual visitors simply to collect knowledge or are they encouraged to engage in dialogue leading to understanding? To use a sporting analogy, does the site provide a season ticket or facilitate a free transfer (Hawkey, 2002b)? Developing visitors understanding, however simply, of the kinds of questions that scientists ask about evidence  and the ways in which they interpret it  should be a key aim of science communication. However, despite some clear statements of policy, the links between data collection and accepted scientific knowledge are often tenuous. Presenting scientific ideas as the best model so far developed introduces scope for further questioning and reinterpretation of evidence. Although many sites explore the scientific research process, there is little evidence of the dynamic interplay between conflicting or competing ideas. Natural history museums as a sector have yet to acquire the confidence to expose the less committed visitor to the issues. The days when barely tolerated, ignorant visitors were expected to be grateful for whatever expert knowledge a curator was prepared to share are, somewhat paradoxically, still with us, at least on some sites. The more committed can, however, find excellent resources, often in the form of on-line essays. With its explicit emphasis on the acquisition of evidence and its subsequent, controversial interpretation, what could be more enthralling than Martian Meteorites, and the search for life on Mars (Grady, 1999)? There are other examples worthy of mention here. The AMNH Web site (www.amnh.org) includes many narratives about expeditions, but how telling is the admission that those to central Asia in the 1920s, which became crucial to the understanding of dinosaurs (Novacek, 1996), were actually intended to seek out the origins of humans? The new natural history museum of the Netherlands (Naturalis, 2001c) includes interesting material, too, that reflects upon the need to re-visit specimens collected 150 years ago, as species are not those attributed at the time. Owens original description of Iguanadons thumb spike as a horn is well known, as is the discovery that Oviraptors name was inappropriately accusatory (NHM, 1997)  but at least the Web sites are not sufficiently arrogant to suggest that misinterpretation was a feature only of the na�ve scientists of the past! Clarifying the status of scientific ideas as theories or models  rather than as incontrovertible fact or the revelation of truth  can lead to a different view of scientific understanding. However, as Durant (1992) has observed of science museums in general, much of the material that is easily accessible on natural history museum Web sites (ie relatively few clicks from the home page) rather gives the impression that science is the sure and solid mastery of nature. It is not that there are no reflective and discursive approaches, but that they tend to be rather deeper in the site. Despite some attempts to indicate how we know or what we do not yet understand, the majority of natural history museum Web sites do present science as a fixed body of knowledge. This is, in essence, little different from the perspective of their Nineteenth cCntury counterparts  the transmission of the curators expert knowledge to an ignorant public. The challenge for museums is to present the dynamism and fluidity of science as well as an authoritative view of current understanding (Hawkey, 2001a). For those prepared to delve deeply, there are alternative insights. In many ways parallel to the discussion of life on Mars  and even more difficult to find  is Stringers (1999) essay, entitled Were the Neanderthals Our Ancestors? Although also concerned with evidence, this provides lively access to the nature and status of scientific ideas. Other insights that could, given an appropriate treatment, really raise visitors awareness of the changing status of scientific thinking are to be found on a number of sites  but often buried without further interpretation in the science for scientists pages. For example, the Copenhagen Zoological Museum (2001) reports its Biosystematics Centre as having discovered and described two new animal phyla, re-evaluated hypotheses about gradients of species richness and produced a phylogenetic analysis of a new mammal species. All new ideas, overturning the old order. Non-scientists  and, especially, the media  frequently express surprise when scientists disagree. And yet, whether or not one takes a Kuhnian view of paradigm shifts, argument, discussion and debate are essential components of the scientific process. Given the inherently interactive nature of the Web as a medium of communication, it is perhaps surprising that there are few examples of facilitating dialogue on museum Web sites, and certainly very few that empower visitors to formulate and contribute their own opinions. However, this is an increasing practice in the science centre sector  although not necessarily on their Web sites  and this may be expected eventually to have an impact. There are rare examples of Web resources that allow visitors to share findings and ideas. One such is QUEST, significant among whose features is an on-line notebook. This provides access to this aspect of science  discussion and debate  that is all too often absent from conventional science resources, and certainly is rarely included as a significant component of formal education (Hawkey, 2000). Certainly, if the museums of the 21st Century are to be places for exploration and learning through discovery where  rather than provide all the answers  exhibits should be interactive and stimulate the visitor to ask questions (Abungu, 1999), then how much more should this be true of museum Web sites. An excellent example of a contemporary natural history museum laboratory is provided by the Pritzker laboratory at Chicagos Field Museum, a core facility dedicated to genetic analysis and preservation of the worlds biodiversity (Field Museum, 2000a). The Field Museums Pritzker Laboratory is a non-departmental multi-user core facility dedicated to genetic analysis and preservation of the worlds biodiversity. It is shared by Field Museum curators, staff members and associated outside collaborators who constitute together one of the most diverse groups of evolutionary biologists and systematists in the world. The lab provides researchers with state-of-the-art equipment in molecular biology, enabling them to pursue the study of genetic diversity throughout the tree of life and at all taxonomic levels, from relationships among populations to classes and phyla of organisms. Systematics is the science involved in the discovery, description, naming and classification of living and fossil organisms and the elucidation of their evolutionary relationships. It therefore encompasses taxonomy, the naming and classification of fossil and living species, although the two terms are often used as if they were synonyms (UK Systematics Forum, 1998). Although it constitutes a fundamental area of study in all natural history museum research, relatively few Web sites make it explicit  and even fewer explain systematics in detail or underline its significance. Those that do, however, give valuable insights into the nature of the scientific study of the natural world. As has been mentioned earlier, The Natural History Museums Web site identifies systematics and evolution as one of its key research themes. The accelerating loss of biological diversity in the world, through habitat destruction, pollution, and ecosystem fragmentation, has been accompanied by a loss of taxonomic experts who are trained to discover, identify, describe, and classify the worlds organismal diversity. Retirement of taxonomic specialists, shifts in academic recruitment and staffing, and reductions in graduate training have conjoined to impede biodiversity research and conservation, particularly on large but poorly known groups such as bacteria, fungi, protists, and numerous marine and terrestrial invertebrates. Vast numbers of species in understudied invisible groups constitute critical elements of food chains and ecosystems, both aquatic and terrestrial, but the high proportion of unrecognized species in these groups limits research and progress in many areas of biology and conservation. This impending difficulty was also highlighted by an earlier UK parliamentary study (House of Lords, 1992) that bemoaned the absence of systematics from formal education courses. Recent discussions (QCA, 2002) have indicated that this omission is being addressed, although it will be several years before any changes can take effect. Despite a number of exceptions such as those exemplified in this paper, the majority of natural history museum Web sites have yet to realize the opportunity to bring their approaches to science and science communication into the modern age. All too often science is presented only as revealed truth and communication as a one-directional transmission. The potential of the Internet for museums to truly share their passion for science, especially the less fashionable areas such as systematics, is clear. That such an opportunity coincides with changes in views about the public understanding of science and about the role of museums (both already evident) makes it an opportunity not be missed. Natural history museum Web sites already provide an extensive resource, but many have some way to go before they are likely to go beyond informing the previously informed or enthusing the already enthusiastic. Most of all, they need to put less emphasis on their own internal organization and rather more on exploring the fundamental principles of science. Abungu, G. (1999). Message from the Director-General. Nairobi: National Museums of Kenya, http://www.museums.or.ke/dg.html, visited 13 February 2002. American Association for the Advancement of Science (1993). Benchmarks for Scientific Literacy, New York: Oxford University Press. AMNH (American Museum of Natural History (2000). http://www.amnh.org/science, visited 13 February 2002. Australian Museum (2002). www.amonline.net.au/research/index.cfm Updated January 2002, visited 13 February 2002. Arnold, K. (1996). Presenting Science as Product or Process: Museums and the Making of Science. In Pearce, S. (Ed. ), Exploring Science in Museums. London: Athlone Press, 57-78. California Academy of Sciences (2000). Systematics - The Science & the Collections, http://www.calacademy.org/research/systematics.html Updated January 2002, visited 13 February 2002. Copenhagen Zoological Museum (2001). Copenhagen Biosystematics Centre. http://www.zmuc.dk/commonweb/cobice.htm visited 13 February 2002. Field Museum (2000a). Pritzker laboratory for Molecular Systematics and Evolution, http://www.fieldmuseum.org/research_collections/pritzker_lab/pritzker/index.html Updated December 2001, visited 13 February 2002. Field Museum (2000b). Partnerships for Enhancing Expertise in Taxonomy, http://www.fieldmuseum.org/research_collections/zoology/zoo_sites/peet Updated 2000, visited 13 February 2002. Grady, M. (1999). Martian Meteorites, and the search for life on Mars, http://www.nhm.ac.uk/mineralogy/grady/mars.htm, visited 13 February 2002. Hawkey, R. (1998). Exploring and investigating on the Internet: virtually as good as the real thing? Journal of Education in Museums, 19, 16-19. Hawkey, R. (1999). Learning from objects on-line: virtue and reality. British Journal of Educational Technology, 30 (1), 73-77. Hawkey, R. (2000). Real Education from Virtual Objects: Active Learning in Science On-line. In Robson, R. (Ed. ), Proceedings of M/SET 2000, International Conference on Mathematics/Science Education & Technology, Charlotte, VA: Association for the Advancement of Computing in Education, 202-206. Hawkey, R. (2001a). Innovation, inspiration, interpretation: museums, science and learning. Ways of Knowing Journal, 1(1), 23-31. Hawkey, R. (2001b). 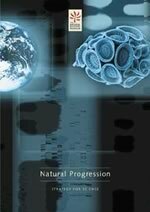 Science in nature and the nature of science: natural history museums on-line, Electronic Journal of Science Education [on-line], http://unr.edu/homepage/crowther/ejse/ejsev5n4.html, visited 13 February 2002. Hawkey, R. (2002b). The lifelong learning game: season ticket or free transfer? Computers and Education, 38 (1/3), 5-20 (in press). MNH (National Museum of Natural History) (2000). http://www.mnh.si.edu/re/index_vision.html Updated 2000, visited 13 February 2002. Naturalis (2001a). Collections. http://www.naturalis.nl/english/collectie.html, visited 13 February 2002. Naturalis (2001b). Eco-evolutionary biodiversity evaluation. http://www.naturalis.nl/english/biodivers.html, visited 13 February 2002. Naturalis (2001c). Collection research. http://www.naturalis.nl/english/documentatie.html, visited 13 February 2002. NHM (The Natural History Museum) (1996) Museum mission statement. http://www.nhm.ac.uk/info/index , visited 13 February 2002. NHM (1997). Dinosaurs of the Gobi desert. http://www.nhm.ac.uk/museum/tempexhib/gobi/gobi2.html, visited 13 February 2002. NHM (1998). QUEST. http://www.nhm.ac.uk/education/quest2/english/index.html , visited 13 February 2002. NHM (2000). Science research themes, http://www.nhm.ac.uk/science/themes , visited 13 February 2002. NHM (2001a). Natural Progression, London: The Natural History Museum. NHM (2001b) Walking with woodlice. http://www.nhm.ac.uk/woodlice Updated November 2001, visited 13 February 2002. Novacek, M. (1996). Dinosaurs of the flaming cliffs.� New York: Anchor Books. Stringer, C. (1999). Were the Neanderthals Our Ancestors? http://www.nhm.ac.uk/palaeontology/v&a/cbs/ancestors.html, visited 13 February 2002. UK Systematics Forum (1998). The web of life: a strategy for systematic biology in the United Kingdom.� London: UK Systematics Forum. Wellcome Trust / Office of Science & Technology (2000). Science and the Public: A Review of Science Communication and Public Attitudes to Science in Britain.� London: Wellcome Trust / Department of Trade & Industry.